Rise Casino arrived on the market in March of 2018 with very little fanfare. It would be very easy for online casino players to see this site as just another of the many, many new sites that arrive on a seemingly daily basis, in fact, that’s something that Rise Casino, like all the fresh-faces in the industry, is going to have to work hard to avoid. The iGaming world keeps on growing at a startling rate and as a result there is always a small space for a new site to slip into, but these spaces also fill up quickly, and, with very few exceptions, fill up with the very best of the best. Rise Casino finds itself in a position where it has to be one of the best new sites of the year in order to achieve a mediocre level off success, is that something this site can do? So, is Rise Casino a site that is going to make the necessary impact? Or will this be just another site to fade into the shadows? Rise Casino is not the most exciting looking online casino you are every going to cross paths with, in fact, it may just be the opposite of that. A truly unimpressive site, it feels like even ugly would be better than the indifference that this design work brings out of the viewer. The artwork is basic, boring, and uninspired, while the colour scheme, while having the potential to be bright, bold, and eye-catching, succeeds in being none of those things despite a host of blues, greens, and yellows fading in and out of each other like they may the first time somebody uses Photoshop, if they don’t have any natural talent when it comes to graphic design. This may seem harsh, but it’s 2018, a newly released online casino site needs more than Rise has to offer in terms of its design and that’s something that Tau should be aware of after their many years in the industry. Yes, navigation is simple enough here, and that’s definitely a good thing, but when you weight it up against the negatives of this design, it does little to make up for them. When it comes to the games a new online casino has to offer, players expect a lot from an early stage now, and Rise Casino, to its credit, does a pretty good job of delivering on that. Not the longest list of software developers you’ll ever see, but arguably one of the most unique, Rise Casino offers titles from 888 Holdings, Bally Wulff, Eyecon, IGT, NetEnt, NextGen Gaming, PariPlay, SG Digital, SG Gaming, Thunderkick, and Williams Interactive. This interesting mix of providers means that not only will you find a good number of slots, table and card games, live dealer games, and more, but you will also find them to have a wide array of themes, designs, and styles. 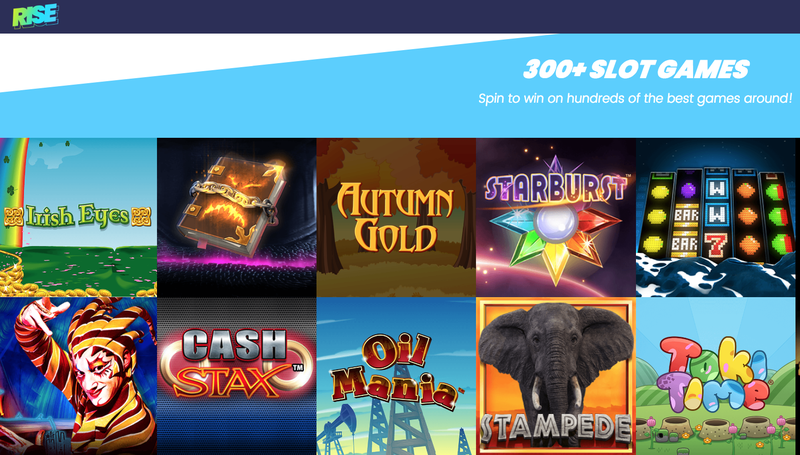 If you are new to the online casino industry, and you want a site that can show you around the various different treats you can expect, and the diversity that exists within singular game categories, then Rise Casino may just be for you. If you are a more experienced online casino player, then you are probably already aware of several brands that give you more options that are better suited for you, so the success of this site is possible, but far from nailed on.